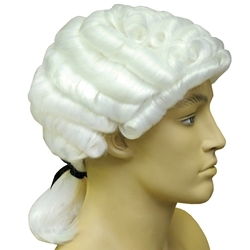 Includes one bargain Barrister wig. The wig features elastic band for a comfortable and secure fit to almost any head size. Barristers are a type of lawyer, while judges are most known for wearing wigs, the lawyers in court wore a similar but not as elaborately styled wig. This wig can also be used for members of parliament, colonial periods, and puritans in shows including The Crucible. This wig is affordable and works perfectly for school projects and reports, historical costumes, or theatrical performances on a budget.